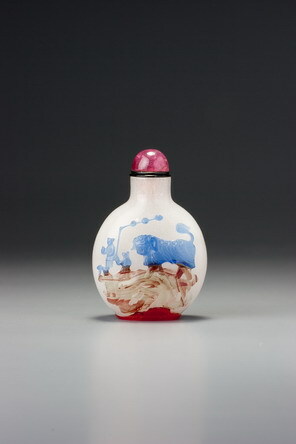 This is one of the more spectacular examples of streaked glass, demonstrating that, while some of the effects might have been accidental, it was also used purposely to great effect. We may be certain that the glassmaker mixed red streaks into the pale green glass to achieve a specific effect. On the side displaying the lion dance, it provides magnificent texturing for the rocky promontory on which the scene is set. On the reverse, the streaks are set diagonally rather than horizontally, providing the delightful effect of sunlight through the pines dappling the children beneath. We are aware, of course, that while the sun is to the left of the tree, its light seems to be slanting down from the upper right-hand corner. In Chinese art, however, naturalistic chiaroscuro had long since been dismissed in favour of its more sophisticated abstract equivalent, hence such inconsistencies would not have been considered a defect by the bottle’s contemporaries. The quality of the carving here is exemplary and the ground plane impeccably finished. Neatly defined though it appears to be around the outer footrim, when the bottle is inverted, we discover that the inner footrim is almost entirely in the ground colour. This hints at carelessness in matching the rim to the overlay colour, which we have suggested was a general trend beginning at some time during the second half of the eighteenth century. It has the wide mouth that we believe was a standard from the earlier phase of production, but probably dates from the mid- to late Qianlong era. 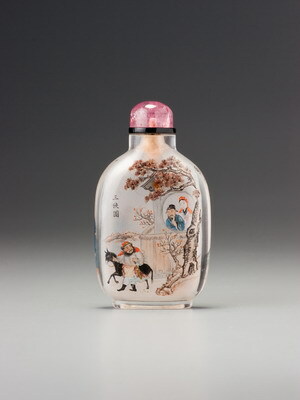 As so often with the finest quality glass carvings, the Imperial glassworks remains a possible source.